Villa in Denia for sale. MODERN STYLE HOUSE WITH HIGH QUALITIES. BUILT ON A PLOT OF 950 m2 , HAS 200 m2 DISTRIBUTED IN 4 BEDROOMS, 3 BATHROOMS. AIR CONDITIONING, CENTRAL HEATING GAS, FIREPLACE, GARAGE, GARDEN, SMALL GYM, JACUZZI, SWIMMING POOL, ALARM SAFETY , LARGE SHUTTERS ELECTRIC, HOME CINEMA INSTALLATION, PRE-INSTALLATION FOR HEATING POOL. LOCATED IN ONE OF THE BEST AREAS OF DENIA, WITH FANTASTIC VIEWS. Modern villa for sale in Denia, very spacious and located in one of the best areas of the Montgó. In a quiet and sunny zone, with people living all year round. Close to schools and all amenities. There is also a Whirlpool. With style and personality, of about 300 m ² living area and a plot of about 1.000 m². Ideal for year round living or holiday. With gardens, swimming pool and parking. Spectacular views and plenty of light, no traffic in this area. Lots of possibilities of building more rooms.Year built 1985. Renovated completely in 2000 and 2016.A good choice. Property exclusively in Denia surrounded by orange groves and close to the Centre of Denia. In this area of Denia was residence of the Spanish Royal family during the summer. The style villa hacienda Spanish 240 m2, built in 1986 on a sunny plot of 6.000 m2 with garden design. South you can enjoy the fantastic view to the mountain of Montgó, eastward the view to Denia's Castle of romanoarabe time, when Denia was "Dianium". The main house of 170 m2 and 70 m2 Guest House have been constantly updated. And they have both basement with storerooms. 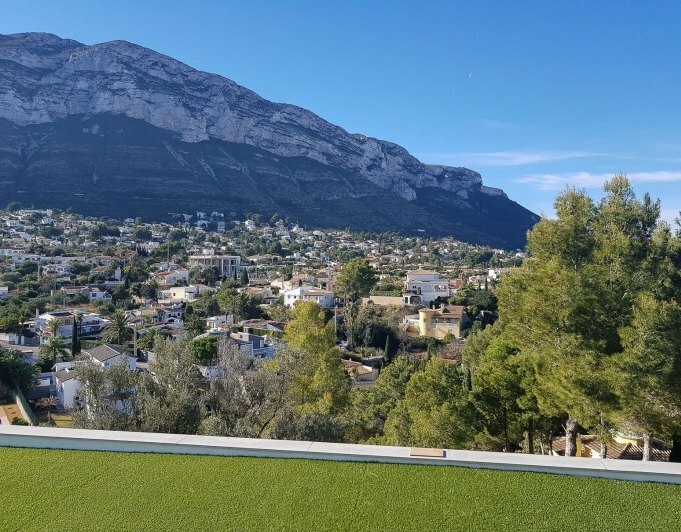 The sunny villa is the ideal place to spend the beautiful winter on the Costa Blanca holiday and offers the perfect location with views to the mountain and the sea. There are 2 km to field 18hole La Sella golf course. Villa in Denia for sale 40 m from the sea. All in a one floor, located in the most desirable area of Denia, Las Rotas, famous for its coves, marine reserve and rocky beaches. Just 30m from the sea and the promenade this villa has a flat plot of 1650m2 landscaped with pine trees and hides many charming corners. The house has 300m2 and has three bedrooms, two bathrooms, large living room with fireplace, open kitchen, utility room and three terraces. Apart there is a guest apartment with 1 bedroom, 1 bathroom, 1 living room and kitchen. Refurbished in 2007. It has laundry, garage and parking for several cars. A second floor can be built and the sea views will be fantastic. The Palm Garden Villa is located in a wonderful place surrounded by nature in an exclusive neighborhood known for its tranquility and direct access to all services. At just 500 meters from city of Denia (⅓ miles) and 2.5 kilometers from the Mediterranean Sea (1 ½ miles), where you can enjoy beautiful beaches, restaurants and entertainment venues. The Palm Villa is close to the Central Hospital of Denia and a big Shopping Center with all kinds of shops, cinema and a large supermarket. The access to the highway is very near, so the cities of Valencia, Alicante and the Airport are close at hand. Charming Villa situated in one of the best residential areas of Denia (San Nicolás) at the beginning of the soughtafter areas of Las Rotas, just 200 metres from the promenade and 300 m from the Marineta Casiana Beach. Completely refurbished and renovated recently, with a surface of 250 m2 distributed over 2 floors with 5 bedrooms, 3 bathrooms, living dining room with fireplace, open kitchen, Equipped with hot/cold air conditioning and underfloor heating. 1500 m2 plot with a beautiful garden, swimmingpool and carport. A lovely quiet and very private house with open views to the sea and green areas. Due to its proximity to the towncenter also ideal for permanent living on the Costa Blanca. Villa in Denia for sale, with every imaginable luxury and two apartments of three rooms each. The best qualities and all imaginable services, swimming pool, barbecue, party room, wine cellar, office, tennis court, playground... two separate apartments, each of 90 m2, distributed in 3 bedrooms, bathrooms, a kitchen and a living room. It also has a private pool, garden, terraces, BBQ, air conditioning, heating, etc.. Located in the Montgo area in Denia. The property is distributed over two floors; five bedrooms and five bathrooms, kitchen, living-room with very a modern fireplace, very cozy. well decorated, paving by"PORCELANOSA", security glass throughout the house. In the basement, there is a gym, party room, a wine cellar, a private bedroom and a toilet. On the outside, there is a magnificent barbeque, a tennis court, a cross motorcycle circuit, a beautiful swimming pool surrounded by exotic and aromatic plants with an automatic irrigation system. Villa with sea views in Denia for sale just 50 m from the sea and 1,5 km to the entrance of the town. Sea front villa in one of the best locations in Denia. The property has 7 spacious rooms Nice garden designed with imagination. A large plot of almost impossible to find today on the coast. Walking distance to some of the best local restaurants.